It must be said that I absolutely loved my baby shower. 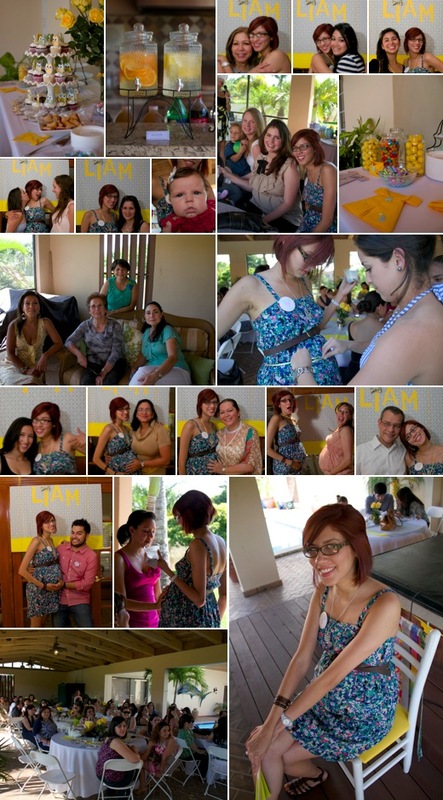 I am still astounded at how beautiful everything looked and how many people came out to celebrate Little Liam. The theme was owls (of course!) and the colors were yellow and gray. I did absolutely nothing to help pull this off. My mom, sister, and mother-in-law lovingly planned out every detail and several other family members contributed their talents to help make it memorable. My dad, grandmother, aunts...everyone had their part and I feel so blessed. All I did was show up and it makes me happy that so many people love this little baby already. I just want to thank everyone who helped...thank you Mami, Papi, Abuelita, Danibel, Reima, Patty, Mima, Mercedes, Maria Elena, the Ortegas, my Tios...everyone. I know it was no easy task but you all did an amazing job! And thank you to everyone who showed up. It really is weird not living in Miami anymore but still feeling all the love and support from our friends and family there. I know we have not been forgotten and that you all still think of us and will even buy presents for a baby you won't be able to see and enjoy everyday. It really amazes me how much love we feel from all of you. It's humbling. And I really can't thank you enough for contributing to Liam's nursery...diapers, clothing, bottles, toys...he has all of these things because you are generous enough to supply them. I promise to post many photos of him enjoying his gifts...and we will be visiting as often as possible. We will definitely be coming by Christmas time so that you all can meet him and we can meet my new niece or nephew who should be joining us by that time (yay, Danibel is pregnant!). And our door is always open to anyone who wants to visit us in beautiful Denver, Colorado. We love you all and miss you. Again, thank you!